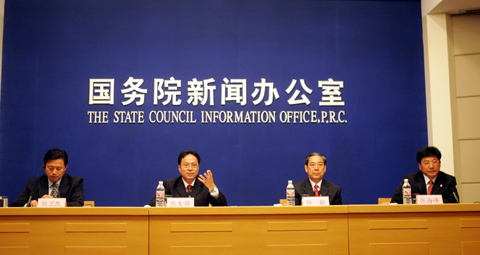 In the morning on July 14, 2005, a press conference marking the 10th anniversary of the promulgation of An Outline of the National Fitness Programme was held at the State Council Information Office in Beijing. Attending the press conference were Zhang Faqiang, Deputy Director of the General Administration of Sport of China (GASC), Guo Min, head of the GASC Mass Sports Department, and Zhang Haifeng, head of the GASC Publicity Department. Zhang Faqiang delivered a speech on the achievements made over the past decade in promoting the National Fitnees Programme, a gigantic sports project that spans two centuries. After the speech Zhang Faqiang and Guo Min answered various questions raised by an interested press on issues of mass sports, school sports, organization of fitness-building activities, construction of easy-to-access venues and facilities, proceeds from sports lottery sales that are used in the national fitness undertaking, legal system building that is crucial to implementing the fitness drive nationwide, as well as measures to be taken for solving the existing problems in these aspects.